After a career of 40 years as a Dutch Marine, Marcel retired in 2004 and needed to find a hobby and find new goals in his life. During his time as a Marine, Marcel also studied and got a degree in Physical Education. He was the first European to attend the AGCP RT convention. It was a great week and he was very surprised by all the help and kindness he got from all the members there. He planned to visit every RT from that moment on and went to RT 4 and RT5. Unfortunately Marcel had to give up RT 6 because he decided to buy a FlightScope and it was the Flighscope or come to RT6. He made the choice for a FlightScope for two important reasons. 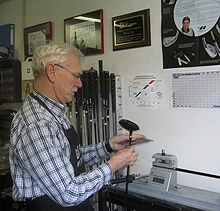 The first was that he needed to have a good launch monitor to be able to apply for an upgrade of his skills level. Up to that moment he had achieved a level 6 and above this qualification a clubfitter needs a launch monitor as part of their equipment to qualify. The second reason was that he felt that he could not serve his customers with the professionalism he wanted to.